noun, plural penumbrae or penumbras. Origin - mid 17th century: modern Latin, from Latin paene ‘almost’ + umbra ‘shadow’. 1) the partially shaded outer region of the shadow cast by an opaque object. 2) the shadow cast by the earth or moon over an area experiencing a partial eclipse. 3) the less dark outer part of a sunspot, surrounding the dark core. Penumbra was the first solo exhibition in Philadelphia dedicated to Victoria Burge and it provided the opportunity to view her complex, meditative work in a new context. Curated by The Print Center’s Executive Director Elizabeth Spungen, the show featured work in a range of media and scale, which trace the arc of Burge’s artistic interests and output over the last seven years, culminating in her largest and most ambitious works to date. It included the debut of several major new works, including a site-specific installation, which although room-scaled, retained the quiet elegance that characterizes all of her creative practice. Burge created delicate and intricately rendered prints, drawings and sculptural works based on maps and systems of mapping. 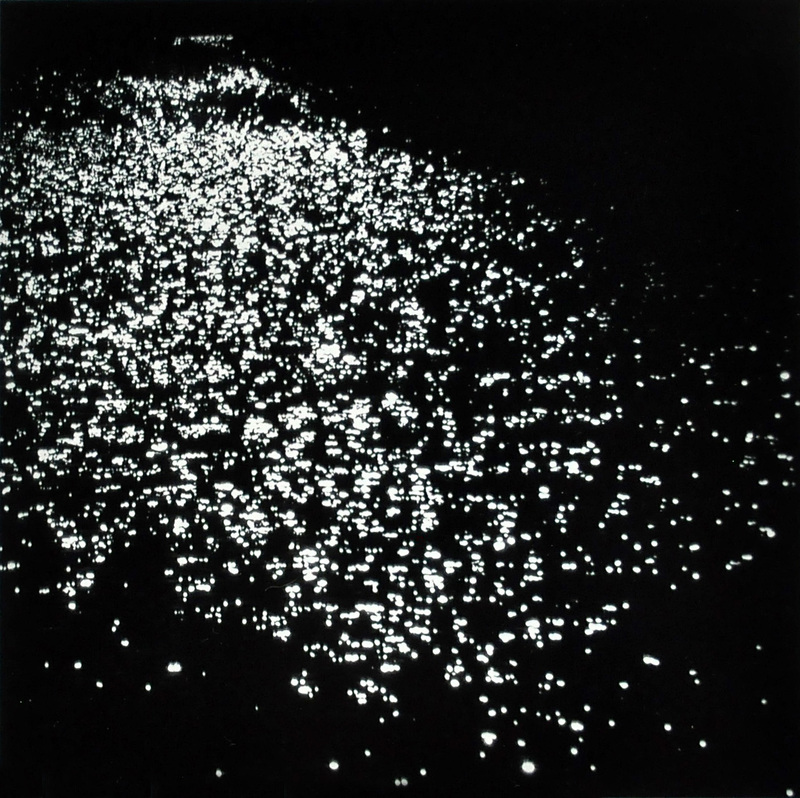 She attempted to chart the myriad effects of light, focusing on its mesmerizing interaction with water. We followed her painstaking and careful process, as she moved between making marks that tracked points of light extrapolated from maps, to capturing light in photographs and video, and ultimately creating her own light effects through projection and intervention. 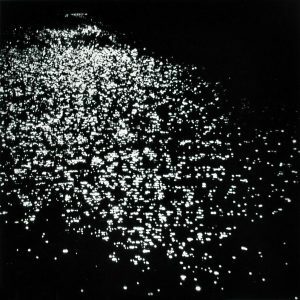 The exhibition was a visual compendium of the hypnotic, glistening, flickering, shimmering, casting of shadow and eclipsing of light both in the sky and on earth. Victoria Burge, Penumbra, Installation view. Photo: Jaime Alvarez. The visual trappings of scientific inquiry were also of interest to Burge, e.g., sample bottles, entomology pins, the array of exhibits in a display cabinet, as well as the scientific techniques of charting, mapping, record keeping and development of a visual code. She was attracted by the sense of wonder and discovery these methods conjure, and situated her work in reference to the worlds of both Art and Science. There was a nostalgia evident in her reverence for the past, connected to the distinctly human impetus of record keeping and the romantic coloration of memory implicit in attempts to capture the fleeting. This was highlighted by the presentation of Burge’s works interspersed with historical materials from her personal collection of ephemera. In Penumbra, she expanded previous boundaries of her practice to play with scale. As the works were delicate and rendered with careful detail, up until then, they had been correspondingly small. For this show, she took all of the ideas central to her earlier works, and translated them both smaller and larger, creating a miniature sculpture from pins and a kinetic wall work from carbon paper pricked with pinholes, as well as a monumental wall-sized drawing, and a room-scaled installation. Burge invited the viewer to consider thoroughly her most central concept, how “light conceals as it illuminates, how it exists simultaneously as both a negative and positive space, how it creates surface but leaves only a perceived impression,” by offering the ability to experience works in a range of scale, angles and perspectives. 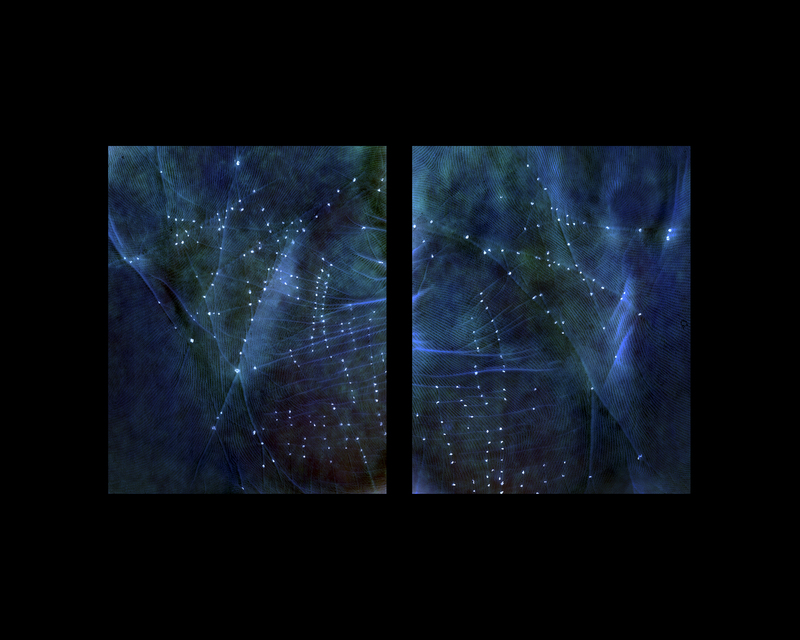 She described her process as “subtractive, abstracting the original cartographic information; plotting invented connections and networks of possible trajectories.” The locations of cities within the maps, became stellar coordinates to which she applied a graphic conceit, sometimes connecting points, with straight or undulating lines, sometimes building new constellations composed of stars of various intensity. 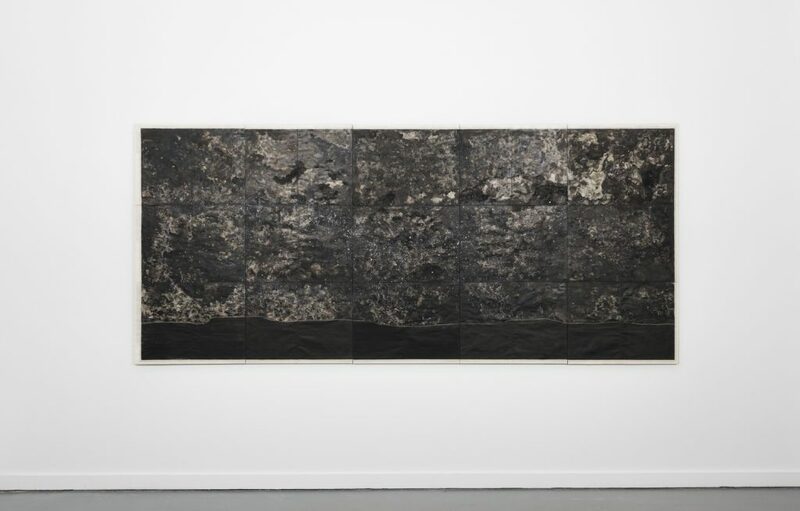 These may have resided on a flat background, or, shone out through layered waves of inky wash.
For the first time she had created work at a scale large enough to relate to the body and render visceral impact. The work that shared the name of the show, Penumbra, was a three-dimensional installation of projected light, matrices and optical effects, that provided an immersive installation bathing the gallery in a mesmerizing display of flicker and shadow. 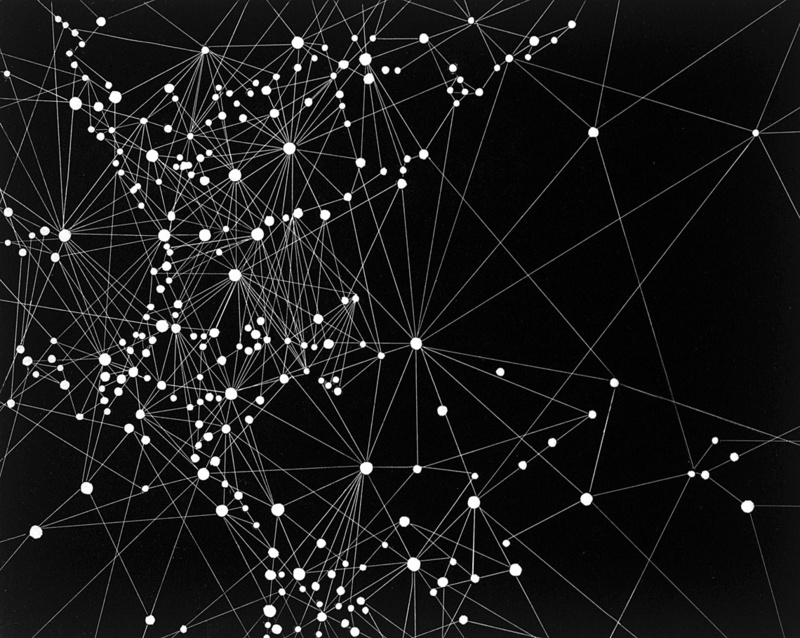 With this work, she charted her own constellation. Combined, the works in the exhibition offered the dual perspective of sky and earth: looking up at the constellations and looking down at a night-lit landscape; balancing terrestrial and celestial cartographies in delicate opposition. Victoria Burge (b. 1976, New York) studied Art History at Bard College, Annandale-on-Hudson, NY; holds an AS in Horticulture from the University of Massachusetts Amherst; a BA from Purchase College, State University of New York, Purchase; and an MFA in Book Arts and Printmaking from the University of the Arts, Philadelphia where she lives and works. Burge’s work has been exhibited in museums, galleries and art fairs, nationally and internationally, including solo exhibitions at Steven Amedee Gallery and Accola Griefen Gallery, both New York and group shows at Frameless Gallery, London; Blum & Poe, Los Angeles; International Print Center New York; and the Philadelphia Museum of Art. She has published editions with Aspinwall Editions, New York; C.R. Ettinger Studios, Philadelphia; Deb Chaney Editions, New York and Stonefox Editions, Philadelphia. Her work has been recognized in Artforum, Art News, Art in Print, and on Printeresting.com. She has received an Independence Foundation Fellowship in the Arts and been a resident at Haystack School of Craft, Deer Isle, ME and Penland School of Craft, Penland, NC. Her work is held in prestigious public collections including The British Museum, London; New York Public Library; Smithsonian Museum of American Art, Washington, DC; the Philadelphia Museum of Art and Huntarian Museum, Glasgow. We are grateful for the project support for Victoria Burge: Penumbra offered by the Edna W. Andrade Fund of the Philadelphia Foundation. Program support is provided by The Andy Warhol Foundation for the Visual Arts. Gallery notes were generously provided by Brilliant Studios. print was only available until November 19, 2016. From left to right: Caleb Charland, Camera Placed On My Solar Plexus While Laying On The Ground At Night For Several Hours, 2015; Christopher Colville, Horizon, 2015; Marianne Dages, An Equivalent VI, 2014; Garrett Hansen, Untitled from the series “The Void,” 2014. 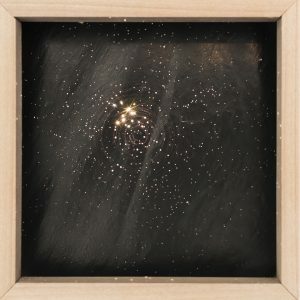 The Print Center presented Celestial/Terrestrial, a group exhibition of photographs and prints featuring work by Caleb Charland, Christopher Colville, Marianne Dages and Garrett Hansen, who created images that resembled celestial phenomena although the images (with one exception) did not derive from the sky. Curated by Executive Director Elizabeth Spungen, the exhibition was conceived in concert with Victoria Burge: Penumbra. 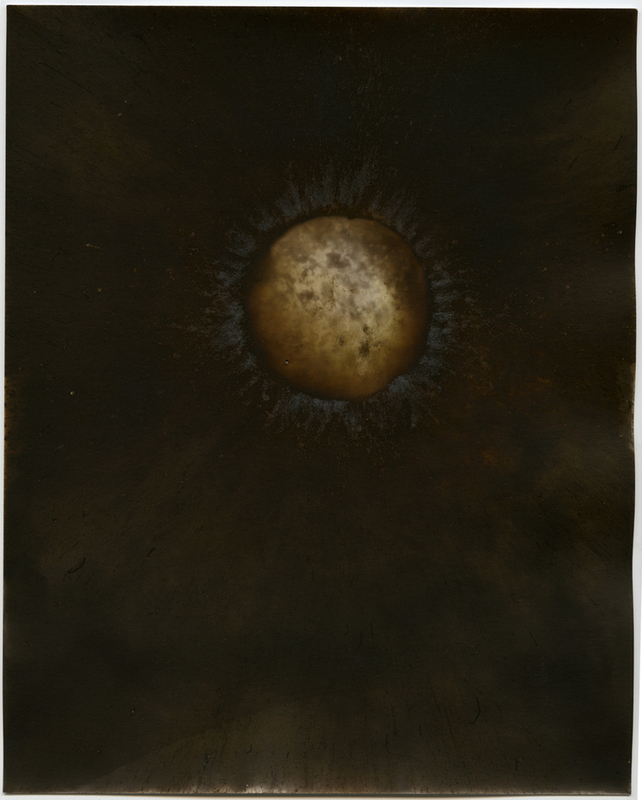 The four artists’ works were inspired by the denizens of the universe: stars, constellations, eclipses, solar flares, meteor showers, northern lights, galaxies, supernovas and black holes, and were made using a wide variety of materials including gunpowder, paper perforated by gunshots, soil and novelty glow in the dark powder. The curatorial premise encompassed two concepts: the first was that we recognize the sky and the universe in just about anything. Just as we identify, the human form from the slightest curve of line in its echo of an eye, a mouth, the curve of a torso, breast or phallus, so we see celestial bodies with equally little prompt. The heavens and our ability to recognize its components have been intrinsically linked to our successful existence on Earth. 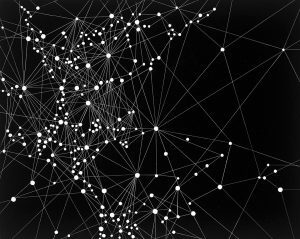 We navigate, migrate and cultivate based on what they tell us. The oceans rise and fall and seasons shift according to its movements. We define ourselves by astrological interpretations. It is no wonder that we read the skies and these images as not just beautiful but sublime. The second related to the process the artists selected to create these works, which not only represented celestial phenomena, but were also created by the energies of the cosmos. The light, the soil, and the explosive energy of gunpowder are all carriers of this universal power. 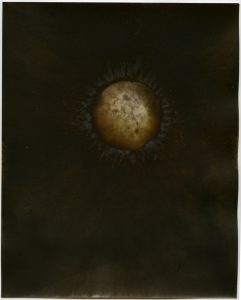 Photography, as a light-based medium, is uniquely positioned to capture such forces; even Dages, the most resolute printmaker in the group, used a photographic process on which to base her prints. Charland grew up in rural Maine, earned a BFA from Massachusetts College of Art and Design, Boston, an MFA from the School of the Art Institute of Chicago and was a participant at the Skowhegan School of Painting and Sculpture, ME. Charland’s work has been exhibited nationally and internationally, notably in solo shows at Gallery Kayafas, Boston; Michael Mazzeo Gallery, New York; Sasha Wolfe Projects, New York and Blue Sky Gallery, Portland, OR. He has been included in dozens of group shows including deCordova Sculpture Park and Museum, Lincoln, MA; Brancolini Grimaldi, London; ClampArt, New York; Philadelphia Museum of Art; and New Mexico Museum of Art, Santa Fe. His work is represented in several major collections including the Philadelphia Museum of Art and the Smithsonian American Art Museum, Washington, DC. He received a prestigious PollockKrasner Foundation grant in 2016. Colville was born in Tucson, AZ. He received a BFA from Washington University, St. Louis and an MFA from the University of New Mexico, Albuquerque. He currently teaches at Arizona State University, Tempe. Colville is the recipient of several awards including the 2012 Critical Mass Top 50; Humble Art Foundation 2009 New Photography Grant; an Arizona Commission on the Arts Artist Project Grant; a Public Art Commission from the Phoenix Commission on the Arts; and an American Scandinavian Foundation Artist Fellowship. His work has recently been exhibited in the Southeast Museum of Photography, Daytona Beach; MIA Photo Festival, Milan; Tucson Museum of Art; Griffin Museum of Photography, Winchester, MA; and The Center for Photography at Woodstock. Colville’s photographs are in the permanent collections of the International Center of Photography, New York; the George Eastman House, Rochester; and the Museum of Photographic Arts, San Diego. Marianne Dages (Philadelphia, PA) named each piece in this group An Equivalent, referring directly to the images of the sky created by Alfred Stieglitz in the 1910s and 1920s titled Equivalents, as well as the work that Vik Muniz made in response to Stieglitz’s works. Stieglitz wanted to draw a connection between the natural world he recorded and the spiritual world, between the cosmos and enlightenment. Dages’ prints were made with earth she collected in front of the printmaking studio while at Penland School of Craft – a location nestled in the spectacular Blue Ridge Mountains where you cannot help but connect to the larger forces of nature. 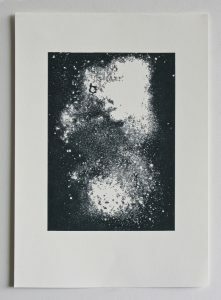 She scattered the soil onto photo-polymer printing plates, which were exposed to light to create a surface to accept ink. She then created letterpress prints using the plates. She likened the mixture of mica, sand and soil native to that location to the terroir of wine. “The resulting images from these prints are reminiscent of the stars,” states the artist, stars which in turn reflect the particular nature of that place. See Vik Muniz talk about the inspiration for and creation of his Equivalents series in this video published by The Museum of Modern Art on February 10, 2016. Dages has a BFA from The University of the Arts, Philadelphia, and completed a Core Fellowship Program at Penland School of Crafts. Her work has been exhibited nationally and is in public collections including the School of the Art Institute of Chicago; Yale University Library, New Haven; and the Museum of Modern Art Library, New York. She has had residencies at Herhusid in Siglufjordur, Iceland and the Beisinghoff in Rhoden, Germany. In 2015, Dages had a solo exhibition at Print Gallery Tokyo, Japan and was a winner of the Fleisher Wind Challenge. Dages lives and works in Philadelphia, where she operates a letterpress and bookbinding studio that publishes artist books under the name Huldra Press. Garrett Hansen (Lexington, KY) shot bullets through black paper, which he placed in a negative holder, enlarged onto film and solarized to create a negative which he scanned and printed digitally. The deep, velvety blacks, from which the clear, stark white edges burst, created abstracted images seemingly quite distant from the shooting range where they were conceived. These works simultaneously referenced both terror and beauty, the horror of gun violence in the US and the explosive energy which created the universe. 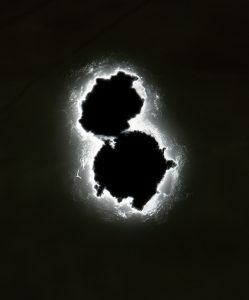 Hansen said, “While shooting is fundamentally a destructive act, by bringing these holes into the darkroom, enlarging them and then processing and printing the results, I am able to balance this destruction with creation.” His work harnessed the tensions inherent to these dualities to create work which spoke to their power. Garrett Hansen has a BA from Grinnell College, Grinnell, IA in International Economic Development. He completed his MFA at Indiana University, Bloomington and has taught in the United States and Asia, He is currently Assistant Professor of Photography at the University of Kentucky, Lexington. Garrett has shown in numerous solo and group The Print Center 2016 Fall Exhibitions 5 exhibitions in the United States, Europe, Indonesia and Japan, including Catherine Edelman Gallery, Chicago; Center for Fine Art Photography, Fort Collins, CO; South Bend Museum of Art, IN; and Griffin Museum of Photography, Winchester, MA.